WMI (Windows Management Instrumentation) has been part of the Windows Operating System since since Windows 2000 when it was included in the OS. The technology has been of great value to system administrators by providing ways to pull all types of information, configure components and take action based on state of several components of the OS. Due to this flexibility it has been abused by attackers that saw its potential since it early inclusion in the OS. As security practitioners it is one of the technologies on Microsoft Windows that is of great importance to master. Until recently there was little to now logging of the actions one could take using WMI. Blue Teams where left leveraging third party tools or coding their own solution to cover gaps, this allowed for many year the abuse of WMI by Red Teams simulating the very actions that attackers of all kind have used in their day to day operation. We will take a look at how Microsoft improved the logging of WMI actions. 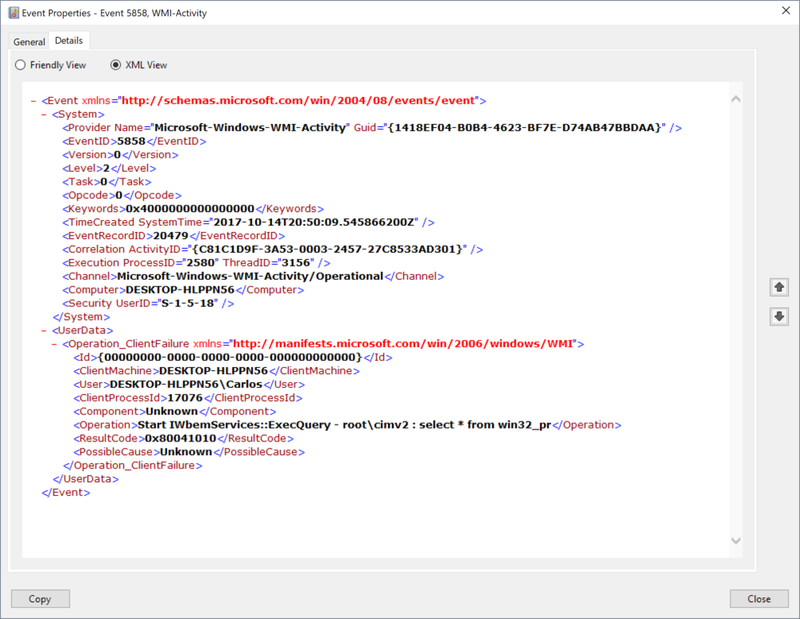 The WMI Activity eventlog provider in Windows until 2012 was mostly for logging debug and trace information for WMI when it was enabled. It was expanded with this release of Windows to have an Operational log that logged several actions. Lets take a look at the provider it self and what does it offer. For this we will use PowerShell and in it the Get-WinEvent cmdlet to get the information. PS C:\> $WmiProv = Get-WinEvent -ListProvider "Microsoft-Windows-WMI-Activity"
PowerShell formats the output of this object so we need to use the Format-List parameter to see all properties and which have values set on them. Lets take a look at the LogLinks or where does the provider saves its events. The one we are interested in is the Microsoft-Windows-WMI-Activity/Operational one. Now that we have identified the specific EventLog name for which we are interested in the events that will be saved there we can now take a look at the events the provider generates. We see that the provider generates 22 events. We take a look at how each object is composed using the Get-Member cmdlet. We can see that each event has a LogLink property and the value is of type System.Diagnostics.Eventing.Reader.EventLogLink. The value is an object of it self. We can quickly take a peak in to the object to see what the values are and how they are formated. We can now filter for the events we want to take a look at. We can now see the events that are specific for that eventlog. We can also see the amount of details we can get for each event, including the XML template for the message. This will be useful when we write XPath filters. We can save them to a variable and pull the IDs for the events. In the list of Event Id we saw this would be event 5857 and it's structure we have some very useful information that is of great help when hunting. As we can see in its structure we have information on the ProcessID and Thread that loaded the provider, we can also see the name of the host process name and the path to the DLL loaded. EventLog Id 5858 logs all query errors, the data include the error code in the element ResultCode and the Query that caused it under the element Operation. The Process Id is also included but in this event it is under the ClientProcessId element. The error code is in hex format. Thankfully Microsoft has a list of WMI Error Constants in MSDN https://msdn.microsoft.com/en-us/library/aa394559(v=vs.85).aspx that we can use to figure what the specific error was. We can query easily for specific result codes using an XPathFilter. In the following exampled we are looking for queries that failed because the specified Class did not exist searching for ResultCode 0x80041010. This could useful if an attacker is looking for a specific class present on the systems. Like a permanent event consumer he can modify for persistence. PS C:\> Get-WinEvent -FilterXPath "*[UserData/*/ResultCode='0x80041010']" -LogName "Microsoft-Windows-WMI-Activity/Operational"
We could also search for queries that failed due to insufficient permissions. PS C:\> Get-WinEvent -FilterXPath "*[UserData/*/ResultCode='0x80041003']" -LogName "Microsoft-Windows-WMI-Activity/Operational"
One of the areas where some have moved to now that the detection of permanent WMI events is more common due to some tools is the use of temporary event consumers. This can be written in C++, .Net, WSH and PowerShell, they allow the use of WMI Event filters to trigger an action that is executed by the application it self. These are not common but easy to write and operate as long as the application is running. We can track this events with events with Id 5860. Once the application registers the Event Consumer the event is created. Here is an example in PowerShell of a temporary event consumer that simply writes the name of a process that has been launched. write-host "Process $($name) was created." When the Event Consumer is registered with Register-WmiEvent we get the following event logged on the system. We can see that the Query being used to monitor for events is logged under UserData under the element Query and under the element PlaussibleCause we see that it is marked as Temporary. When a __EventFilter, and any of the consumer type class objects are used in the creation of a Binder instance in the WMI CIM Database to create a permanent event a eventlog entry with Id 5861 is created. The event is also created in modification if any of the component class instances are modified. The event will contain all the information associated about the permanent even in the UserData element under the PossibleCause subelement. When __EventFilter or Consumer that make up a permanent event is modified it generates the same event but there is no field in the data to show if it was modified or not. The event says to look at Event Id 5859 for the __EventFilter class that makes up the permanent event but at the moment I have not seen a event created with this Id in all my testing. From a Red Team perspective this lets us know that our actions can be tracked and we should look if this events are collected when we measure the level of maturity of the target. From a Blue Team perspective these are events you should be collecting and analyzing in your enviroment for possible malicious actions.